Gábor Kovács (Orosháza, 2 January 1957), banker, art collector, philanthropist and founder of KOGART. Having studied at the Moscow State Institution for International Relations (MGIMO) between 1975 and 1980, he started his career at the Hungarian National Bank. He was the first managing director of Citibank Budapest from 1985, before becoming the vice-president of Citibank London. Back in Hungary by 1991, he founded Bankár Holding Plc., which he now heads as president and CEO. It was at this time that he began to collect works by, as well as to support, Hungarian artists. His collection spans the history of Hungarian painting from the early 18th to the mid-20th century. On 8 November 2003, he established the Gábor Kovács Art Foundation with a HUF 3 bn capital stock, and opened KOGART House on 20 April 2004. He has been a member of the Trilateral Commission since 2006. 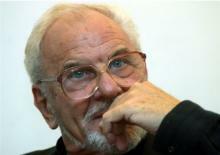 2005: Summa Artium Award, “For Contemporary Art” category, for his extensive work as an organizer and supporter of art. I learnt my sensitivity to beauty from my mother. As a child, I was already intrigued by man and landscape: beauty and harmony, the sense of space and the horizon, the meeting of the sky and the earth. Of course, I had no idea of such abstract notions in Kakasszék. All I knew was that people there were sincere and earned their living with hard work. Beauty is of course subjective. A face, a tree, a train arriving at the Kakasszék station, a lake nearby were beautiful. The larks starting to sing in spring and the return of the swallows showed the harmony of life. The birds gathering in autumn before migration hinted at transitoriness. Kakasszék is the past. It has changed. It has lost its character. Most of the elderly have left for other beauties. My mother moved closer to me. The feelings, however, are the same. This emotional world echoes in my collection, in this book. In my early youth I was not too receptive to art. I was over thirty when it touched me. Since then I have been its captive. In 1991, for the empty walls of my new office I bought eight pictures, only Hungarian ones. The first sampling proved successful. Works by István Csók, Gusztáv Magyar Mannheimer and Márk Rubovics are still noted items in my collection. Collecting became a passion and stole into my everyday life. My scope of interest kept streching toward 19th-century classicist, romantic landscapes, then early 19th-century portraits, and I got to Nagybánya as well. The legacy of Ádám Mányoki and János Kupeczky is also part of the Hungarian athmosphere. The Hungarian National Gallery wanted Ferenc Rákóczi II to re-marry Charlotte Amelie, princess of Hessen. With my help, they managed to do so—for the duration of the Ádám Mányoki exhibition. Lajos Gulácsy and Tivadar Csontváry Kosztka found me, too! By some miracle, masterpieces find me. The encounter with the paintings of Károly Markó the Elder had an elementary impact on me. I was wholly overcome by the passion for Markó. György Károlyi comissioned Károly Markó the Elder to paint a picture in 1836. It was Women by the Well (Serpent Killer). The picture was owned by the Károlyi family during the past 150 years and it came into my possession by the courtesy of the heirs of Katinka Andrássy. It was an incredible accident again that I came across another latent chef d'œuvre known only in verbal description: St. Paul Shipwrecked on Malta. One Markó picture attracted the next. I bought the sixteenth item of my Markó collection at a Sotheby's auction in London in the summer of 2003. Another masterpiece—the painting had never been seen in Hungary. It was purchased by a Spanish infante after Markó's death in Italy, in the 1860s. I take greatest pride in this segment of my collection: the romantic landscapes, the Markós, Ligetis, Telepys. I probably owe it to this encounter that now I have not only some three hundred pictures but also a collection spunning from the early 1700s to 1935 expressing more or less the same sensitivity. When it comes to the second half of the 20th century, however, I am at a loss. It was just a few years ago that I began to open up to this period. The works of art grow in number—Jenő Barcsay, Menyhért Tóth, Endre Bálint and the lifework of János Bozsó, just to mention a few names. This material has not matured into a coherent whole yet. That will be my collector's task for the next ten years. The organizing principles are binding: sincerity, beauty, harmony... Works of art that are close to me, that touch me. The past thirteen years of my life was about business in the first place and collecting art was only secondary. Giving up my post in London, I went into entrepreneurship. I wanted to show my expertise in my country. There were many transactions, many successes, my fortune increased. I kept rushing on, to new challenges, to new transactions. I did not realize the enormous difference between wealth and eternal values. I thought I would succed in achieving everything. I was wrong. After three years of bitter struggle, one day in 2002 I caught sight of Zsuzsa Péreli's latest work, Aequilibrium, on the wall of the Gobelin Museum in Aubusson. I immediately knew where I had made a mistake. It took just a nick of time to realize that the missing element in my successful but lopsided life was equilibrium. I had to create harmony not only in my environment, among the Markós, but also in my own soul. I realised that genuine equilibrium was not horizontal but between spiritual goals and earthly values. Between "Heaven" and "Earth". Earthly goals in heavenly perspectives. From the horizon of Kakasszék through the beauty of Markó's landscape I arrived at Péreli's search for equilibrium. I wish that everyone will cover this road in their hearts. These experiences gave impetus to the idea of the Gábor Kovács Art Foundation. The 21st century is the century of foundations. Foundation is the future. The art works being created now will enrich the collection of the Gábor Kovács Art Foundation. We would like to build a collection characterized by beauty, harmony, a search for equilibrium, by inspired sincerity representing high spiritual goals and eternal values hidden in external beauty. I am sure that in the next one hundred years we will find the artists who "come in touch with God" as Csontváry says in his diary. After sixty years of solitude, our art will be part of European art again. And to the joy of us all, a collection will be created involving real values which have a message for us all. After primary and secondary schools in Kakasszék and Orosháza, Gábor Kovács unexpectedly found himself in the State Institute of International Relations in Moscow, then at the Foreign Exchange Policy Department of the Hungarian National Bank. Soon he was the executive manager of Citibank, then vice-president of Citibank in London. The little boy from Kakasszék, who learned the skills of trading in his father's pub and, as the old photos show, made clay bricks with his friends in 1962 for 10 fillérs apiece, standing in muddy sandals on the edge of the cornfield, first became the founder, owner, and board member of several large companies. He is currently one of the decisive personages of Hungarian economic life, whose private wealth is simply fabulous. That, however, is not his fate but represents some external events of his life. His fate is building his meteoric career from scrap. With self-consciousness aroused early, he has walked his way persitently, with great calm. Not because he is hankering after money or career, but because he realised what he was destined to do in this world. "You can only rise from what you create." And Gábor had to create something here in the world of money and economy. He has trodden his path so far as if following in someone's footsteps who covered the same road: in a few years the son of the Kakasszék inn-keeper became familiar with the international money market, concluding banking transactions involving hundreds of millions of dollars as if he had always done so. In perfecly unfamiliar situations he immediately realised which step to take, even amidst the most unexpected turns. When he received an offer in the course of his souring career thet would have sent anyone dizzy and gasp for air, he usually declined and started for the uncertain and unknown. Later it always turned out that the unknown was not only his road but also the more lucrative road.Not that he calculated everything in advance; there is someone inside him (there is no better explanation) who sees and tells him what to do. He hears an inner voice that he follows faithfully. Egoists cannot hear this voice. That's a psychological law. Egos are afraid of guidance and eagerly thirst for gain, their horizon stops at the verge of sober reason and they never plunge into the unknown. They are incapable of saying no, for they are too hungry and the never choose the uncertain future in place of the sure gain. The rising life course of Gábor Kovács is signposted by 'no's given to great offers and 'yes's given to the apparently uncertain future. His fate is also guided by some kind of foresight: if the word were not so hackneyed, I would say intuition. Intuition means "taught from inside". His calm is of a person who knows that the path he is treading is his, and he can give account to his only master, his self-knowledge, about everything he has created. I think he is that rare person who has never had another master but himself. When he told me his life, I was listening to the confessions of a man who always only listened to himself – and that was not headstrongness; he has always had someone to pay attention to. In the early twentieth century, Europe saw a turning point in the history of art. All eyes turned to Paris, where Fauvism was booming. Led by Henri Matisse and other famous names such as Vlaminck, Van Dongen, Marquet and Braque, Hungarian artists with the same enthusiasm took to the use of large flat areas of bright colours to give life to shimmering canvases whose affinities reflect perfectly the existence of a European culture.